By Jr. Woods, Thomas E.
Most Americans trust that their history professors and high school teachers will give students honest and accurate information. 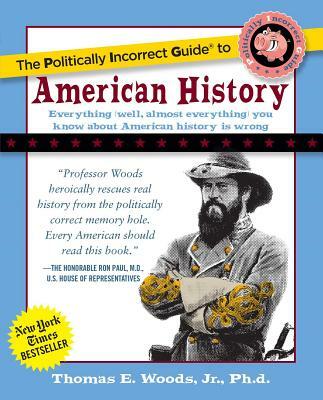 The Politically Incorrect Guide to American History makes it quite clear that liberal professors have misinformed our children for generations. Professor Thomas E. Woods, Jr. takes on the most controversial moments of American history and exposes how history books are merely a series of clichés drafted by academics who are heavily biased against God, democracy, patriotism, capitalism and most American family values. From the real American “revolutionaries” to the reality of labor unions, The Politically Incorrect Guide to American History is all you need for the truth about America—objective and unvarnished. Professor Thomas E. Woods, Jr. holds a bachelor’s degree in history from Harvard and a master’s, M.Phil, and Ph.D. from Columbia University. Professor Woods is a prolific essayist on historical subjects and is a contributor to five encyclopedias and dozens of popular and scholarly periodicals including The Christian Science Monitor, Investor’s Business Daily, and The New Oxford Review. Professor Woods is currently a professor of American History at a division of SUNY (State University of New York) and was formerly a teaching assistant at ColumbiaUniversity. He serves as a lecturer across the country. Woods is associate editor of The Latin Mass Magazine and is the author of The Church Confronts Modernity: Catholic Intellectuals and the Progressive Era. Professor Woods lives in New York with his wife and daughter.